I realize I just shared a breakfast cake last week, but Mother’s Day is just around the corner and I thought I would give you options. 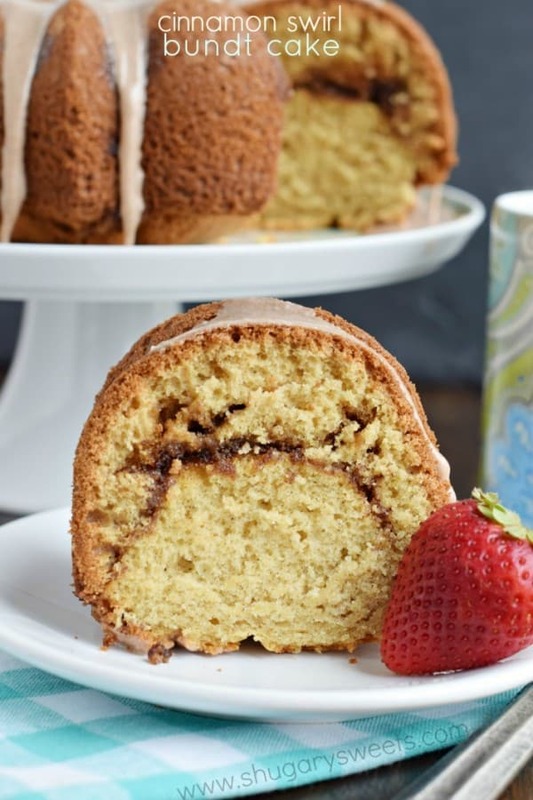 You could make last week’s Lemon Crumb Cake or today’s Cinnamon Swirl Bundt Cake. But why choose? Make both, I say! Speaking of mothers….it’s happened. I’ve become my mother. Actually, I think I’ve become a senior citizen in general. A couple days ago I found myself talking to the birds and squirrels. And whistling in the back yard as I filled my bird feeders. Who does that besides Mary Poppins? I have nothing against old people. I embrace this elderly side of myself. I just have to chuckle that this is where I am in life. Spending hours watching the birds and squirrels in my yard, while singing a happy tune. , no issues. EVER. I usually wipe it with a little crisco and sprinkle with flour, and voila…it releases EVERY. SINGLE. TIME. You can also use the baking spray that has flour in it, if you prefer. I’m always afraid that it will cause build up in my bundt pan and affect the non-stick aspect of the pan. 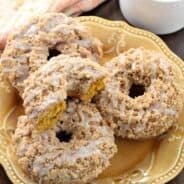 Don’t forget to make the cinnamon glaze. I made a very thin glaze, unlike some of my other “frostings.” Remember, you want to make sure that people accept this “cake” as breakfast, haha, so don’t overdo it on the frosting. Otherwise it will take some convincing! Now, while you all are in the kitchen baking…I’m going to head outside to relax with my friends. Mr Squirrel and Mrs. Robin. A sweet cinnamon breakfast cake with a rich cinnamon swirl. 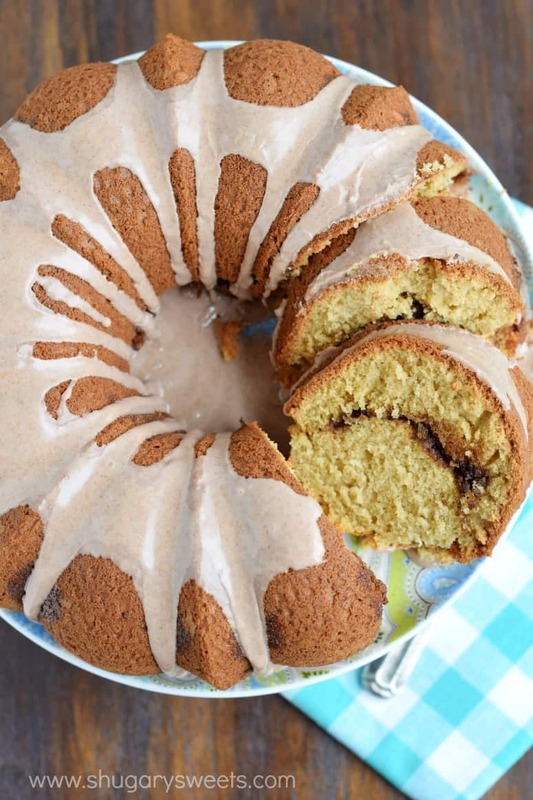 This gorgeous bundt cake is topped with a decadent cinnamon glaze! For the cake, grease and flour a bundt pan and set aside. Preheat oven to 350 degree F.
In a mixing bowl, combine flour, sugar, baking powder, baking soda and salt. Beat in softened butter until mixture is crumbly. Add in eggs, vanilla, cinnamon and milk. Beat for 3-4 minutes until smooth and fluffy. In a separate mixing bowl, combine brown sugar and cinnamon for the filling. Use a fork to blend evenly. Pour half of the cake batter into the bundt pan. Sprinkle the cinnamon sugar mixture over the batter. Top with the remaining cake batter. Bake for 55-60 minutes until browned. Allow to cool in pan about 10 minutes, then flip onto a cake plate and cool completely. For the glaze, whisk together the powdered sugar, 2 Tbsp milk and cinnamon. Add more milk if needed to get desired consistency. Drizzle over cooled cake. Store covered at room temperature for 4-5 days. ENJOY. Looking for more bundt cake recipes? Here are a few of my favorites! 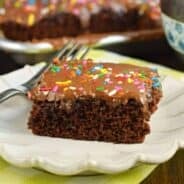 Chocolate Zucchini Bundt Cake: rich and fudgy, this is a great recipe to add a little extra veggies without the kids knowing! 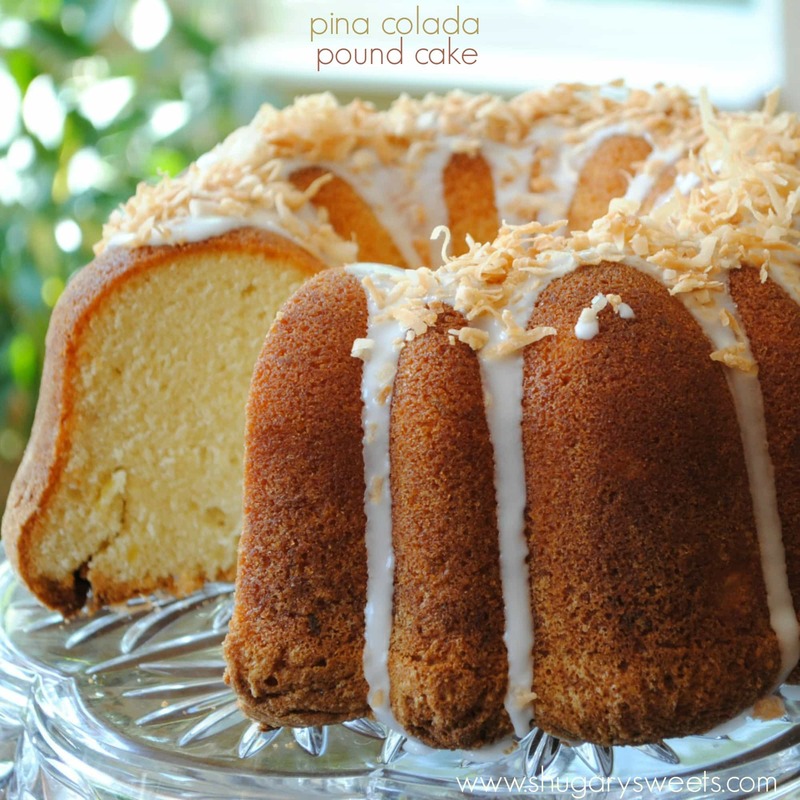 Pina Colada Pound Cake: perfect pound cake with rum flavor, pineapple and coconut! 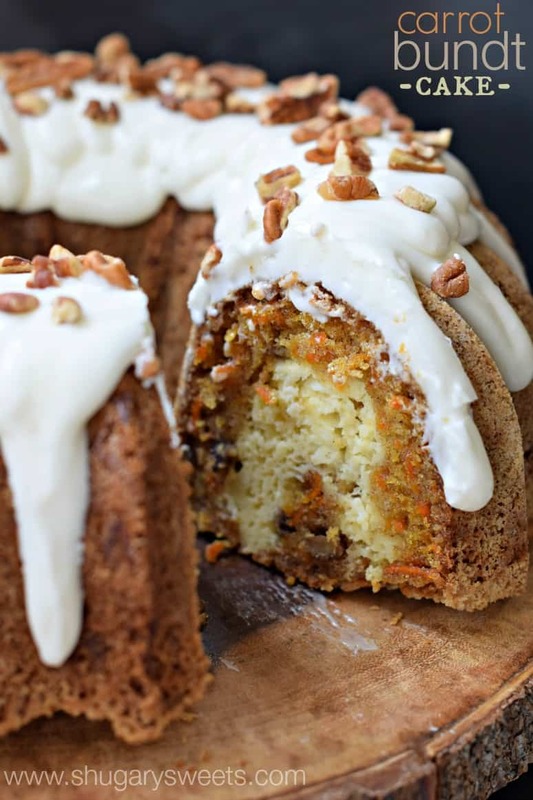 Carrot Bundt Cake: delicious carrot cake with cheesecake filling and cream cheese frosting! Bring me all the breakfast breads! Lemon and cinnamon are always a great idea…and blueberries thrown in too for good measure! LOVING your logo down the side. SO FUN and creative Aimee! Oh… and this bundt cake. I could seriously go for a slice of it with 2nd cup of coffee this morning. It looks amazing! 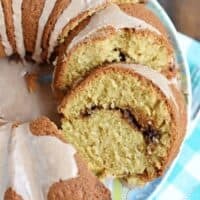 I love that cinnamon swirl through the bundt cake! I would absolutely request this for Mother’s Day! I can’t wait to be a grandmother and spoil the kids rotten, then hand them back to my angry kids. The perfect revenge! And talking to birds sounds very Cinderella. Maybe you’re a Disney princess at heart? Hahaha! I love that you have become your mom and I have become mine. I haven’t started talking to the critters in the yard though. I would totally become granny though for a slice of this goodness! I’m all about cake for breakfast…and that cinnamon swirl inside is calling my name! Oh I’m starting down the road to becoming like my mom. But she’s a pretty cool lady, so I can’t complain too much I guess. I’m totally down for cake for breakfast! No complaints from me (even if the frosting was super thick and sugary! Ha!). I love this cake! And I love that you are Mary Poppins 🙂 It’s funny how our life changes and we actually take time to enjoy our own life. This bundt cake is so gorgeous!! 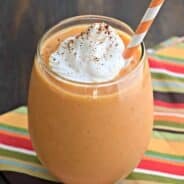 The more cinnamon, the better. Yum! We’ll be the same kind of grandma’s. Haha, love it!! Oh I totally do the same thing – hum, whistle, talk to the animals as I’m doing things outside or around the house! It makes it so much more fun and happy though, doesn’t it? Totally digging this cake, Aimee! I could go for a HUGE slice right now! This is what you wrote..(6.For the glaze, whisk together the powdered sugar and cinnamon. Drizzle over cooled cake. )….You may want to add some milk or butter to the powder sugar & cinnamon to make it drizzle, just a suggestion. Yum this look so good! I love any excuse to eat cake for breakfast! 😉 P.S. your new design looks super cute! Umm… Am I missing something? Powdered sugar + cinnamon doesn’t exactly make a “pourable” glaze… Is this a mistake? I just got powder…. Sometimes I think I need an editor! Yes, you need to add 2-4 Tbsp milk. Recipe is all fixed! Thanks Aimee!!! I was wondering… LOL! What a gorgeous looking Bundt Cake Aimee! You are making me hungry with this! 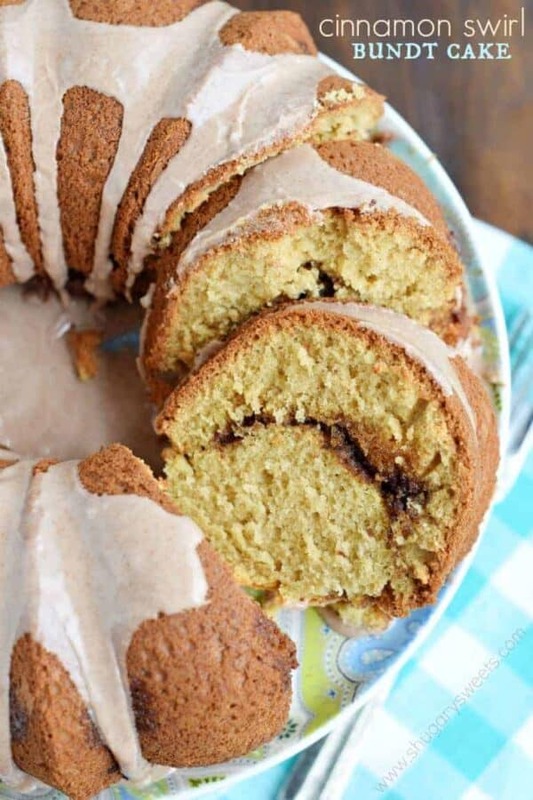 This bundt cake looks fabulous, Aimee! I absolutely ADORE the cinnamon swirl down the middle. YUM! I’m never gonna complain about breakfast cake-esp. this gorgeous cinnamon swirl bundt! can i have the size of the bundt pan,please? 1 cup of brown sugar for filling turned out to be a bit much when I made the cake…or maybe I used a smaller bundt pan??? My cake tastes great but split where the cinnamon/sugar went, I think the ratio is too large or maybe I need to make more of a tunnel in the cake, any suggestions? This is the cake of my dreams! A big slice with my morning coffee is most definitely happening! Yes, you’ll make a heck of a grandma one day 🙂 This bundt cake and all your other treats are to-die-for! This looks delicious. I love having something sweet for breakfast but hate getting up to make them. Love that I can do this the night before. 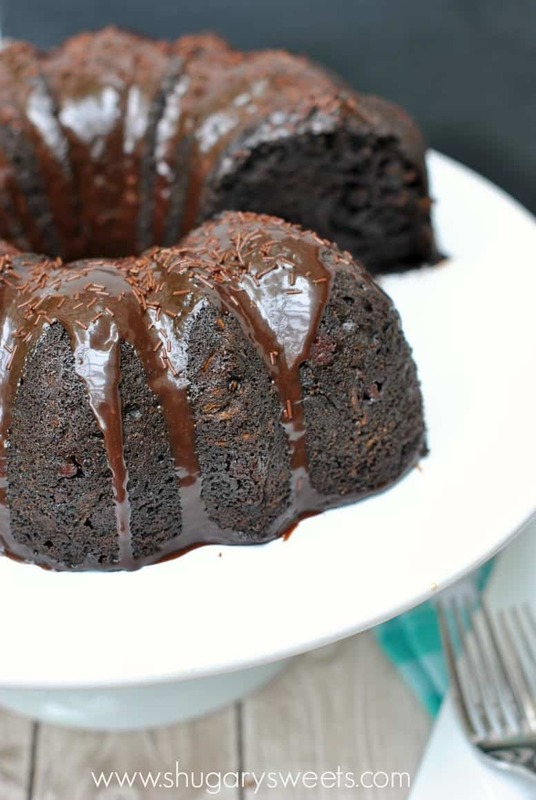 Your bundt cake looks so moist and flavorful! You are the queen of bundt cakes!! Every bundt cake Ive ever made from you I just love…. Ive got everything to make this so Im going to try this one over the weekend! This cake is absolutely perfect. We love it for breakfast!! Can’t tell you how much we love making it! 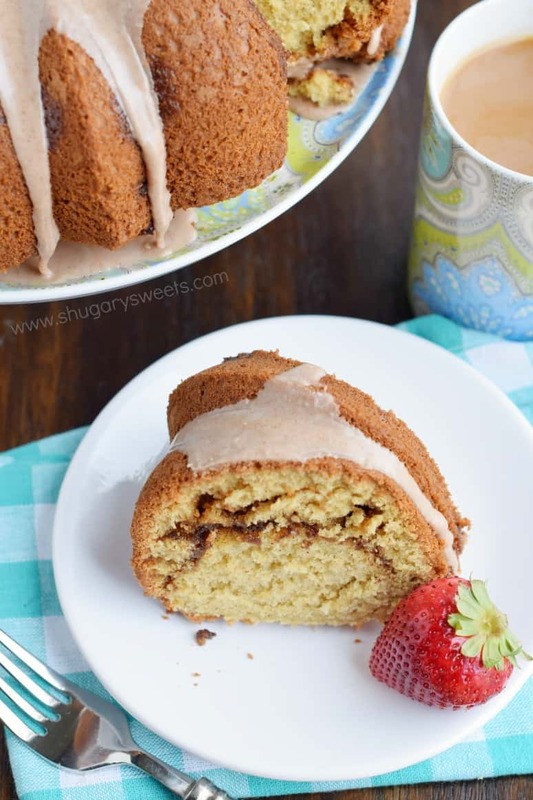 I love bundt cake for breakfast and I have a hot cup of coffee just waiting for a slice of this cake!